Jaded Blossom: See ya lator Alligator!! Barb from BugBites here with another Jaded Blossom inspired project. I have a quick little treat card today. It's fun to leave these behind after a visit to someones office or home. I started with the base card using the Jaded Blossom scallop slider and topper die. 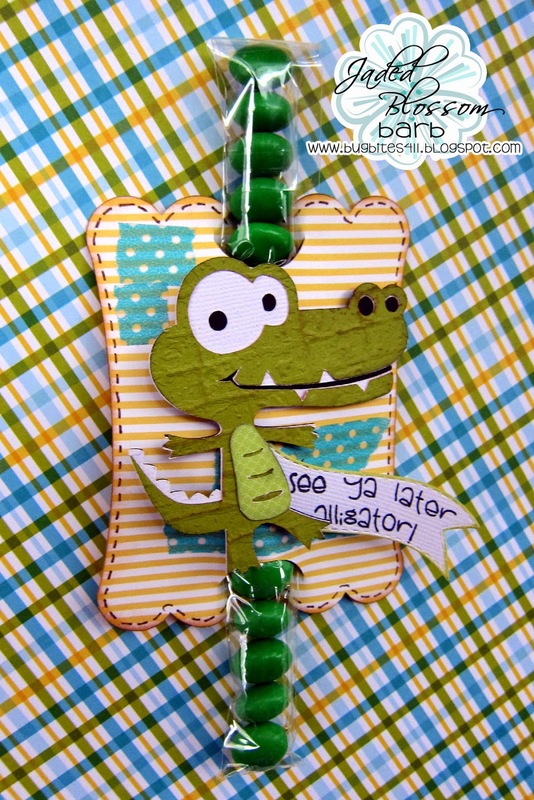 Once I had the treats in the bag and slid through the card, I embellished with some washi tape and this cute alligator which coordinated nicely with my sentiment. Don't assume all look at ought to be placed in a auto look at winder. chanel replica Easily swiss wrist watches never worn out not less than quite a few a short time and also an accumulation of different watches, has to be if the following develops. patek philippe replica If you require a person, it is far better purchase a high-quality solution. It can provide a resilience within your priceless look at. fake rolex Were you checking out Cartier different watches for girls, owing to you and also the most perfect lovely lady in the life long? Thank you. replica watches sale Cartier would make definitely iconic swiss wrist watches : different watches this take a position just about only because global most well-known, high quality, plus pleasing. fake watches uk Previously it was Louis Cartier's lifelong mandate to set different watches that were a "perfect steadiness amongst beauty, shape, plus operation, inches and although your dog deceased around 1942, each of modern strains with Cartier different watches for girls continue to embody this mandate. Jaded Blossom: December Guest Designer Month! !